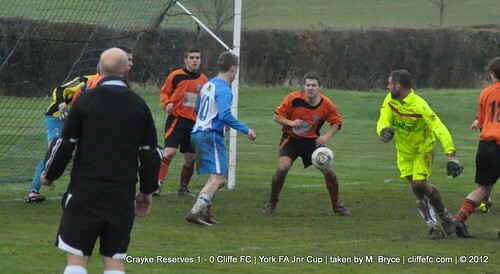 Cliffe FC are eliminated from the York FA Cup, losing 1-0 at the hands of Crayke Reserves. ~ Keith Tiplady, 25th November 2012. 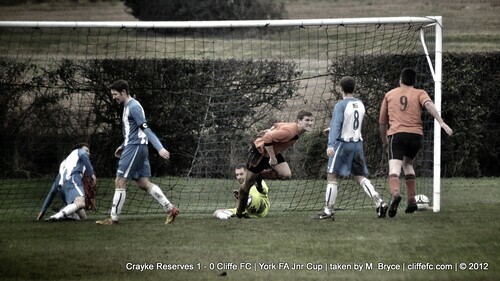 The cup tie started at a quick pace with Cliffe hitting the woodwork early on, Nathan Parker’s effort hitting the bar. Crayke were given something to hold onto when they opened the scoring, a short goal kick down the right wing ending up in-behind Cliffe and eventually bundled in to give the underdog’s a 1-0 lead. Crayke had the ball in the net again but was disallowed for foul on ‘keeper Ally Harris. Cliffe continued to dominate possession and when the ball broke to Kev Taylor with the goal gaping a clearance off-the-line stopped the away side levelling, the Crayke defender sliding into the post as he cleared the ball unable to continue, sustaining a nasty injury. Cliffe ranks suffered a nasty looking injury before the half-time whistle, Paul Tanton colliding with both ‘keeper and a bundle of players head-first – Tanton did well to carry on in the second half but had to be subbed off citing blurred vision in one-eye. Tom Dunning hit the foot of the post at close range, from the final chance of the first-half and Crayke lead 1-0 at the interval. 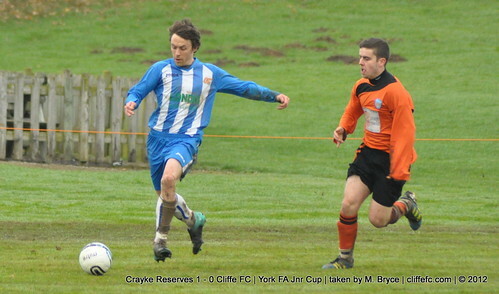 Cliffe’s near misses continued in the second half as many chances were either blocked or missed narrowly as Crayke hung on Taylor and, Cliffe man-of-the-match, Billy Atton having to rally some big challenges in the process. Wes Pears came close having a close range shot blocked by ‘keeper and defender, and numerous Cliffe corners and set-pieces going begging. Crayke again had the ball in the net, but this time disallowed for a hand-ball. With the final attack of the game ‘keeper Ally Harris went up for the final roll of the dice from Keith Tiplady and when the ball was knocked on by Harris to the feet of Dunning who crashed the ball agonisingly against the bar, that summed up Cliffe’s (lack-of)luck on the day. Crayke go through to the next round, 1-0 FT. Both Cliffe FC sides back in league action next weekend as 1stXI face Bishopthorpe Utd and Cliffe FC Reserves travel to face St Clement’s Reserves.